Today’s featured image made me smile because it is such a happy photo of two friends sharing a laugh. When I found out the story behind the photo it warmed my heart. There’s something undeniably special about the bond of friendship. Friendships that evolve out of mutual respect for one another are extra special. An image of two friends laughing while walking their dogs is so simple yet at the same time powerful. While I don’t particularly care for calling out blind people for doing ordinary things, Faith’s photo spoke to me. What it said was one word—joy! Yes, Faith is blind and uses a guide dog. Savannah is not and raises guide dog puppies. A match made in heaven? Eh, could be. But in this singular period in time, these are just two friends sharing a joyful moment. The image is a faux fashion magazine cover titled Blind Beauty. 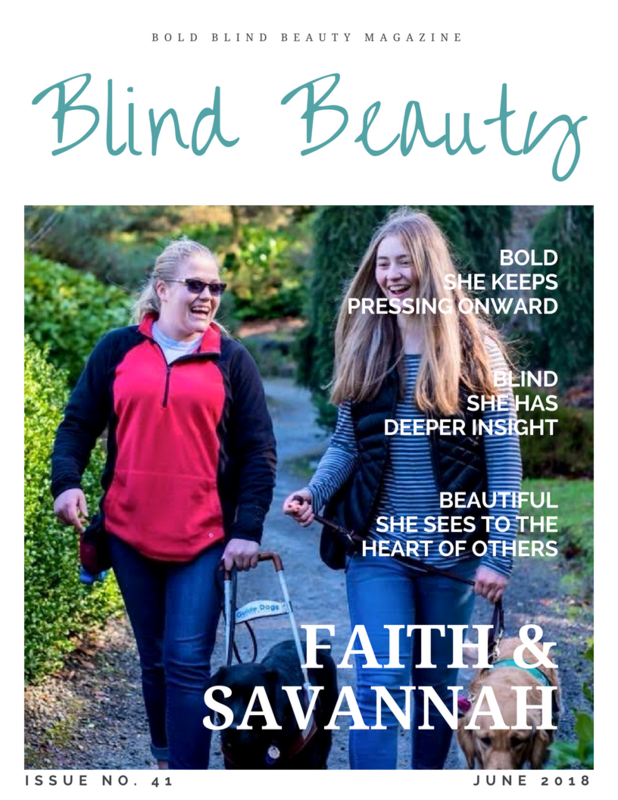 Faith & Savannah are on the cover sharing a laugh as they walk with their dogs. Both have long blond hair; Faith’s is in a ponytail and Savannah’s is loose. They are both casually dressed in jeans as they walk on a wooded path. Previous post: How Do Blind People Exercise? I love this photo as well. Thank you Robyn!💗 I hope you are doing well.